Those who are calling for a second referendum on the United Kingdom's withdrawal from the European Union overlook an inconvenient truth: Leavers detest the EU more intensely than Remainers love it. So we must hope that Prime Minister Theresa May gets her amicable divorce when Parliament finally votes on it in January. So British Prime Minister Theresa May lives to fight another day. The Conservative Party in the House of Commons reaffirmed its confidence in her leadership by a far-from-resounding 200-117 vote. It is hard to think of another British prime minister whose leadership has been in such continuous crisis. Not so much an iron lady as a stubborn and dogged one, May has begun another round of effort to extract a few further concessions from European leaders to make her divorce agreement more palatable to her party, if not a majority of the public. The British people decided in June 2016 to leave the European Union, by a slim 51.9%-48.1% margin in a national referendum. After invoking Article 50 of the Treaty of Lisbon, the United Kingdom is due to leave on March 29, 2019. But the Irish question, the Conservative Party’s internal politics, and parliamentary arithmetic have made the Brexit process anything but straightforward. The UK and the Republic of Ireland share a land border separating the latter, which will remain in the EU, from Northern Ireland, which is part of the UK. Brexit, therefore, would leave Northern Ireland outside the EU’s customs union, and the Irish Republic inside it. Hence May’s agonized efforts to secure a deal that prevents a “hard” border with customs checks. This is not just a matter of economic convenience. It is literally a matter of life and death. When Ireland won its independence from Britain in 1922, six mainly Protestant counties remained in the UK under a system of devolved government. Two legacies of the truncated United Kingdom survived: free trade and free movement of labor between Britain and the new Irish state. The incomplete victory over Britain rankled in the predominantly Catholic Republic of Ireland; until 1999, the Irish constitution included a commitment to the “reintegration” of the whole island. At the same time, Northern Ireland’s dwindling Protestant majority clung ever more fervently to the British connection. Following three decades of violent conflict between the province’s Irish nationalist and Protestant groups, resulting in over 3,600 deaths, the Good Friday Agreement in 1998 established a Unionist-Nationalist power-sharing executive in Northern Ireland, along with a British-Irish Council as a nod to harmonious relations with the Irish Republic. Any hardening of the frontier would jeopardize the fragile peace secured by the Good Friday Agreement. If the power-sharing agreement breaks down, men of violence on both sides would be waiting in the wings. 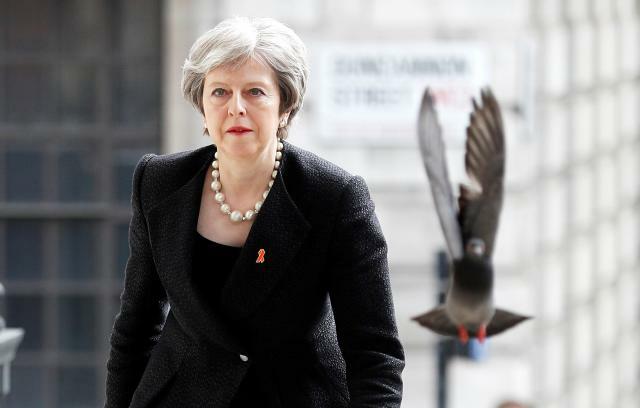 To avoid this outcome, May’s plan provides for Britain to leave the EU but remain “temporarily” in the customs union, pending the negotiation of a free-trade agreement with the EU, with the “backstop” of a guaranteed open border between Northern Ireland and the Irish Republic, come what may. As if this weren’t bad enough, Parliament is split between those who want to leave and those who want to remain. This cleavage cuts across the ruling Conservative and opposition Labour parties. The Remainers fall into three groups: those on the left who see the EU’s “social market” approach as a source of protection for British workers; business and financial interests who count the economic costs of Brexit; and idealists who want Britain to play a constructive role in the political unification of Europe. The Leavers also comprise three groups: Thatcherites who view Brussels as a “super-state” bent on stifling free enterprise; a partly overlapping group that envisages Britain as an independent part of a global free-trade system; and the “left-behinds” who want to preserve Britain’s cultural identity and keep out foreigners. The composition of parliamentary forces reflects May’s disastrous decision to call a snap general election in 2017, which resulted in her losing a Conservative majority. And the 317 Conservative MPs who remain are split about 200-100 between those who back May’s proposed Brexit plan and those who want Britain to “crash out” without a deal. Support for May’s deal from the opposition – 257 Labour MPs, 35 Scottish Nationalists, and a few others – is uncertain, at best. Likewise, the ten MPs of Northern Ireland’s Democratic Union Party, on whose support the government now depends, are torn between wanting free trade with the South and fear of being sucked into the Irish Republic if and when the rest of Britain leaves the customs union. The DUP has denounced all talk of a special arrangement or “backstop” to enable Northern Ireland to remain in the customs union in lieu of a UK-EU free-trade deal. Given the divisions in her own party, May will be forced to depend on Labour MPs to get her agreement through Parliament. No one knows how Labour MPs will vote, and the incentives facing the party are mixed. On the one hand, voting with the Leavers to scupper May’s deal would probably lead to a general election, which Labour could win. On the other hand, Jeremy Corbyn, the party’s leader, can have no great appetite to accept the poisoned chalice that May would pass on to him. There’s an understandable temptation to say, “If Parliament can’t decide, let’s throw it back to the people.” But there’s no clarity about what exactly “the people” would be asked. It is playing with fire to seek a second vote on the ground that you did not like the result of the first one. And there’s one further issue to bear in mind: Leavers detest the EU more intensely than Remainers love it. If the Remainers win a second vote, a passionate resentment will sour British politics for years. So we must hope that May gets her amicable divorce when Parliament finally votes on it in January.